A story so poignant and powerful it transformed the Jewish educational system of Eastern Europe. In 1899, Jacob Dinezon’s short novel, Yosele, exposed in vivid detail the outmoded and cruel teaching methods prevalent in the traditional cheders (Jewish elementary schools) of the late 1800s. Writing in Yiddish to reach the broadest Jewish audience, Dinezon described the sad, poverty-stricken, and violent life of a bright and gentle schoolboy whose treatment at the hands of his teacher, parents, and rich society is shocking and painful. The pathos and outrage resulting from the story’s initial publication produced an urgent call for reform and set the stage for the establishment of a secular school movement that transformed Jewish elementary education in the early 1900s. Translated into English for the first time by Jane Peppler, Jacob Dinezon’s Yosele presents a rarely seen sociological and cultural picture of Eastern European Jewish life at the end of the nineteenth century. Jacob Dinezon, like Charles Dickens, championed the poor and oppressed, especially children. Called the first sentimental writer of modern Yiddish literature by literary scholars, Dinezon used his pen to expose the hypocrisy and injustice in shtetl society, and his stories reveal a deep love and commitment to uplifting and enlightening the Jewish people. Scott Hilton Davis is a storyteller, playwright, filmmaker, and collector of Russian and Eastern European Jewish short stories from the late nineteenth and early twentieth centuries. Convinced of the historical, cultural, and ethical significance of stories by Sholem Abramovitsh, Sholem Alei­chem, I. L. Peretz, and the lesser-known writer, Jacob Dinezon, Scott now uses storytelling and publishing to bring works by these beloved Jewish writers to new audiences. He is the author of Souls Are Flying! A Celebration of Jewish Stories and Chanukah Tales from Oykvetchnik. 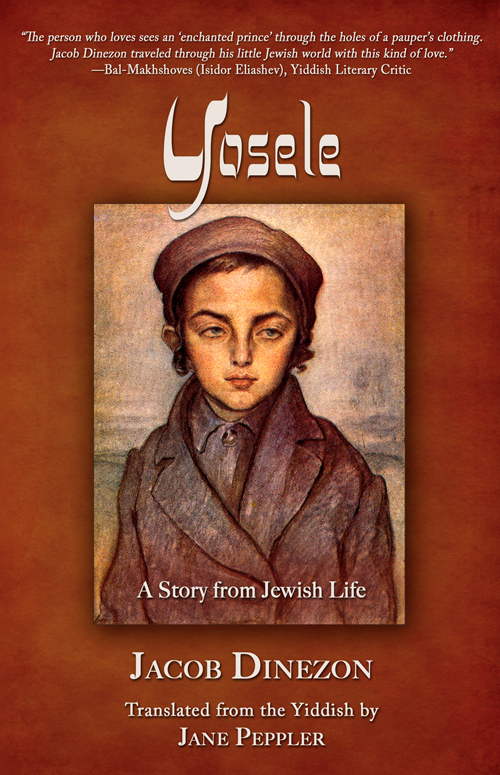 Yosele: A Story from Jewish Life is available in paperback and Kindle ebook. Buy online or special order from your favorite bookstore.